Google Doodle features a couple of peacocks crossing their beaks at the centre, and the national birds are flanked on both sides by a Bengal tiger and an elephant. Internet giant Google on Wednesday dedicated a doodle to mark India’s 72nd Independence Day. The doodle is inspired by the nation’s truck art. It features a couple of peacocks crossing their beaks at the centre, and the national birds are flanked on both sides by a Royal Bengal tiger and an elephant. Google said the doodle was inspired by “Indian truck art, a longstanding tradition in this four million square kilometre nation where truckers who live on the road surround themselves with cheerful folk art to occupy their minds during long months away from their families”. 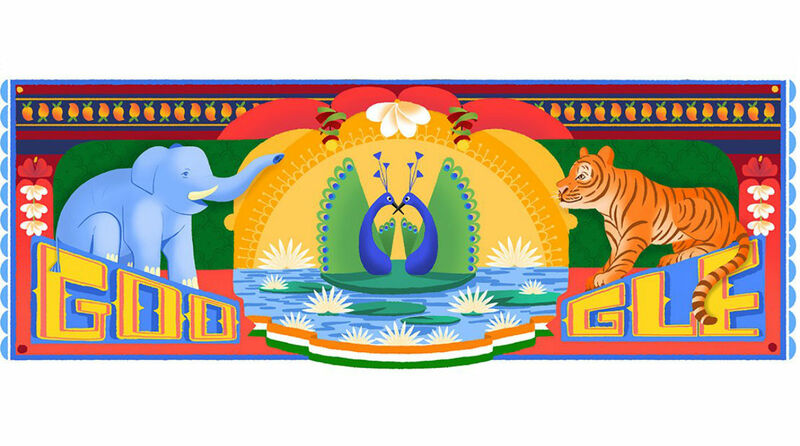 Other than peacock, tiger and elephant, other elements featuring in the doodle are India’s national flower lotus and national fruit mango, with the sun rising in the backdrop and colourful flowers and the Tricolour at the bottom. “Thousands of kites dot the skies over India as the country celebrates its 72nd Independence Day. Both a solemn and joyful occasion, this marks the day in 1947 when India became an independent, autonomous state, fulfilling the dream of leaders like Mahatma Gandhi and Jawaharlal Nehru,” the page reads. The doodles on Google’s main page are temporary logos to commemorate holidays, events, achievements and people. Previously, the Red Fort, various versions of the Indian flag, Mahatma Gandhi’s Dandi March and Indian postage stamps have been incorporated in Google’s Independence Day doodles for India.